Happy New Year, MuseBlog! 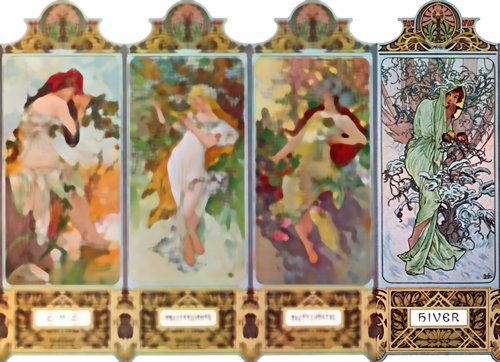 Love the Art Nouveau image! My family went for our usual walk on the beach, even though it was so cold Dad said we’d get frostbite if we stayed out more than 14 minutes. He went back to the car after we took a picture, but Mom and I walked around a bit. There was a runnel (a shallow pool of water along the beach refreshed by waves but separated from the ocean by the rest of the beach) a bit back from the breakers where the water was rippling in the breeze, and because it was so shallow, we could see the light playing on the sandy bottom. It felt like a very summery sight even though I had every centimeter of skin other than the area right behind my glasses covered up by at least one layer and there was snow on the sand (snand?) farther up the beach. I wished I could make a little force field of heat around my body and just walk around in normal clothes exploring the empty beach without having to worry about freezing. Obviously, I couldn’t, so we headed back to the car and watched the waves from inside before Dad took us all home. I want to appreciate nature more this year and go hiking more, but it’s hard to start when it’s so very bitterly cold at the moment. I did get to go for a bit more of a walk today– even if it was just down the block. Along the way, I got the mail and picked up some trash, so I felt good for being useful. But my glasses got so fogged up that I had to wait and pull down my scarf when I wanted to cross the street, because otherwise I wouldn’t have seen light-colored cars coming. I made it down the street to the corner and then down the side road a bit– making sure to stay in the sun. In the summer I did the same walk many, many times, going much farther onto the backroads, but with the frostbite warning and the early sunset, I didn’t want to risk it. The snow is getting thinner on the fields after several days of clear sky and bright sun, but it still covers most of them. The geese are the only animals really about, and most of them are hunkered down among the remains of cornstalks, looking for any scrap of food left behind, I guess. Tomorrow it should be warmer– the freezing point at least– and J. will be home from spending New Years’ with his girlfriend, so perhaps we can take a longer walk, maybe even at the wildlife refuge– I don’t think I’ve ever been there in the snow. A thin blanket of snow overnight. Time to shovel the walks and steps and sweep off my car before the really cold air arrives. The cats want me to stay near them, but alas. And now the weather bomb has hit and we’re in the midst of the blizzard. Perhaps J. and I may go out into the backyard in the afternoon, but I don’t think we’ll get much farther. At least my new deodorant pack already came in the mail yesterday. I regret not posting anything for most of the past week, but as it was so bitterly cold and the snow was very deep, nobody in my family really went much of anywhere except to church. But on Monday, J.’s girlfriend came to visit and it’s been fun having another person to talk to. She’s very friendly and quick-witted, and they are very happy together. Most of the original exhibits are still there– the ray touch tank at the entrance, the wing devoted to the Riverhead Foundation’s rehabilitation of stranded animals (there was only one turtle in the viewing tank at the moment, but we were told that with the intense cold this winter, there had been a lot of cold-stunning and we could see from the whiteboard that two others had been taken in for care recently), the submarine simulator ride we never go on because it’s expensive and makes you dizzy, the touch tank that looks like a shipwreck, the boardwalk over the sand shark lagoon, and of course almost everything in the main “Atlantis” room. But there were new exhibits, too, including discus fish, young alligators, a whole set of new insect exhibits in the butterfly room, a porcupine, and South American coatis, agile relatives of the raccoon. In the tropical bird exhibit, all of the parrots swarmed J. when he came in with the food he had bought at the entrance, landing on him, pecking at him, and trying to get the lid off of the container so that they could get at the seeds. One even unbuttoned the top button of his shirt! There weren’t many guests because it was during the school week and there was still a lot of snow everywhere, so we were able to get around without any crowds and ask the keepers and docents a lot of questions– we timed our visit so that we got to see an otter training session (they’re used to the cold and really like the snow), the feeding of the fish in the Amazon tank, and talks about the penguins and sharks. (We were just too late to see people cage-diving in the shark tank.) Java, the big male sea lion, is 16 now (his species can live into their twenties), and still performing in the sea lion show like a champ. Our only regret was that many of the outdoor exhibits were closed because it was winter, including the snorkeling lagoon and the salt marsh you can wade in. Ah, what a delightful experience! I love aquariums, ray touch tanks, and parrots. And everybody in the world loves otters. It’s the point in a vacation where ennui starts to get in, but I’d take the normal form of it any day to feeling like that AND having my inter-term paper to write before classes start up a week from yesterday. At least this is the week I would have gotten my Master’s if our department hadn’t switched to giving out both certificates at the doctoral ceremony. If not a milestone, still definitely a landmark. Pies to you! Well, I submitted it, so as soon as I get the signatures on the cover sheet and turn it in to the secretary, I’ll be in the PhD program. I got signed up for something like that by people who called claiming to be from Smithsonian Magazine and I ended up having to cancel my card and get a new one because of it. So I submitted my paper, followed up about my PhD proposal (and now have approval from 3/4 of my committee), bought notebooks for class, installed most of the software I need for my data visualization class (and the one thing I’m having trouble with, the professor promised he’d help me with), bought notebooks for my classes and a replacement Krafft/Cousteau beanie at Strand to replace the one I lost… not a bad first day back! I got an A- on my paper! Professor D’Alfonso liked the theoretical background and thought I had a lot of good ideas that I can develop for my PhD, there were just a few factual mistakes I made. Between “Up, Up, and Away”, “Stormbreaker” and (because I just finished it) “Brainboy and the Deathmaster”… just how common was “Free software given away to schoolchildren is actually part of evil plot” as a storyline in 2000s children’s media? I don’t know how many people will come on this site before then, but as a heads-up, the NOVA episode about “Solar Impulse 2″‘s solar-powered circumnavigation of the world will premiere tomorrow night on PBS. Wow, what a beautiful and awesome documentary about a beautiful and awesome mission! The flight was more fraught than I had realized even when watching live, and even though I knew exactly how it ended, I was still getting frustrated at the problems and rooting for André to cross the Pacific safely. They didn’t discuss anything that’s happened since the end of the circumnavigation two years ago, but the knowledge kind of hangs heavy over the whole program. Certainly, progress has been made on many environmental issues and the pilots themselves have done good work with their new foundation, but it does sometimes feel like some of the rest of us have let down André and Bertrand and the promise they showed us. Sorry that I missed it! Maybe it will be rebroadcast sometime. It’s free to watch on the PBS website now, but sadly nowadays that’s all they do, there isn’t a mini-site with interviews and articles like NOVA did 15-ish years ago. Happy birthday, Groundhog and Pollyhymnia! Cold and rainy all day today. I stayed inside and got a lot done. Now I’m going to not-watch the Super Bowl. What’s up with you all? Spent the weekend sick in bed with a sore throat and then a runny nose. Now trying to catch up on my work for Wednesday and hopefully go to a lecture at AMNH tonight if I finish this reading. Nothing much. Pruning the shrubbery. Carving a citole. That sort of thing. “Citole”… Is that one of those big Maya karst sinkhole things? It’s sort of a hole, but it’s surrounded by wood. I’ve never noticed it sinking. Must be the British equivalent. Do you use them for irrigation, or do they have some ritualistic significance? But they haven’t been used at all recently. I’m expecting a major revival once I’ve finsihed the carving. Aww. Why would anyone want to alleviate my carefully crafted confusion? Mainly because the links have lots of pretty pictures. a 10K day if you were born between Sep6ember 17 and October 14, 1990. Our appartment’s toilet is still clogged even though we called maintenance yesterday, and I lost my credit card sometime in the past 24 hours and didn’t realize it until I saw a book I wanted at Strand. Happy 209th birthday, Abraham Lincoln and Charles Darwin! I had to miss the belated Darwin Day celebrations at the Biological Anthropology department because this the day I’m in class from 2 until 7:45 (well, today until 8:30 because we went on a trip to a potter’s workshop– I didn’t do very well for my first time trying to use a potter’s wheel, but nobody else did, either). On the plus side, nobody else bought the signed copy of Steve Fossett’s autobiography that I saw at Strand a week ago but couldn’t buy I lost my credit card and was waiting to get the replacement in the mail, so I picked that up tonight. Sadly the weather changes messed up my sleep and I was too tired to really go anywhere, so I missed it. I moved to NYC today! I say moved, but I really only have a suitcase & a backpack, & no permanent place to live yet, but once I get a place the rest of my stuff will join me in it. Unsurprisingly, I’m working on a boat, this time for a year long contract instead of a couple months. I’m looking forward to getting to know the city a bit better. I happen to know it’s a very pretty boat. Fiddler! Can we Kokonvene? I’m free this weekend! I would love to kokonvene! I’m not sure what this weekend looks like for me, probably I’ll be searching for housing. But! I’ll be here for a whole year, so there’s lots of time. We can also grab Annie for a visit too, I stayed with her last night. There’s a presentation about underwater ROVs at AMNH on Sunday that I want to go to, and Monday is my birthday. Do you still have my e-mail from when we met in DC? Found it! And I emailed you. The science fair was great, they had a live video broadcast from the JOIDES Resolution, the famous ocean-coring ship, which is docked in New Zealand now after just returning from an expedition in the Antarctic. A geologist told us all about the work and used her tablet computer to show us all around the ship, including the labs and the bridge. I got to touch a plastic-enclosed seabed core that showed the KT-impact boundary– you could see the little tektites created by the impact in this very dark layer, and the geologist said there was probably iridium in that section when I asked. There was a puppet show based around traveling to the bottom of the ocean where they turned out all of the lights in the whole hall and shone a blacklight on the puppetry stage, so the puppet creatures were glowing like real deep sea creatures– the comb jelly and hatchetfish looked almost alive, although the hydrothermal vent suffered because there was no way to show “smoke”, just the chimney. And I found out that on Friday SYLVIA EARLE is going to be speaking at the Museum, so now I have to go get tickets because… SYLVIA EARLE! Happy birthday, KaiYves! May your second quarter-century be as wondrous as the first. Why is it sunny on the days I either have class or projects and cloudy the other four days out of the week? The sun likes to mess with your head. That’s why you need to live someplace where it’s always sunny. Then you don’t mind having to work indoors, because you know your free days will be just as nice. Today, we had a snowstorm, but it worked out in my favor, because my uptown class got reduced to half an hour (which was kind of disappointing because for once I actually managed to get the programs to run nearly perfectly and was ready to give a good presentation), and then my evening class got cancelled. So I was able to take my time going home and walk through Central Park in the snow, which was beautiful, albeit very windy and wet. Maybe I’ll go back tomorrow when it’s settled. I met Gimanator on Friday and Lizzie on Saturday. Quite a weekend! Rest in physics, Stephen Hawking. And a bittersweet Pi Day to all. I played Dungeons and Dragons with my brothers and hiked with them. My goals for this Spring Break are achieved and now I can hopefully force myself to spend the next two days working on my homework. Happy vernal equinox and Nowruz, everybody! And of course we commemorate the equinox in the traditional Northeastern fashion with a nor’easter and snow day. What is traditional nor’easter food like? I got an apple and some cereal so I can eat breakfast in my apartment, but the dining halls are open and by the time I go out for dinner some restaurants might be, too. Never sleeps, never stops, etc. Lovely march in downtown Washington today. I was in the crowd on Pennsylvania Avenue and 11th Street, in front of the Trump International Hotel. People of all ages and descriptions were down there, including throngs of high school and college students. The Parkland kids were amazing — so poised and articulate. Marjorie Stoneman Douglas High School must be giving them an education worthy of Muse Academy itself. Happy birthday, Shadowkat! 10K day coming up on August 10! I was worried about the two presentations I had to give today, as I had trouble finding enough information for one, and for the other, I realized there were problems with the maps I had digitized and WHY THE CAKE IS IT SO HARD TO MAKE GRAPHS IN PYTHON… but in both cases, the professors understood my problems and suggested things I can do differently in the future. Which I will, but tonight, I just really need to sleep. Have you looked at graphing libraries for Python? There are quite a few of them. I haven’t looked at graphing in detail (yet), but it’s often easier to use a library than to write complex code from scratch. This article covers a few of the main libraries. I found templates (is that the word?) online, but they weren’t clear about where to swap out my information for the variables they used in their examples. Have you tried matplotlib? The reports of its complexity are greatly exaggerated: you do need to put in a few hours, but after that it’s super-customizable. We’ve used it a few times in class, I think. The good news is that the Professor is coming to understand that a lot of us have trouble with Python and going slower with us, as well as letting us take more time to work things out. I merged two spreadsheets and created a boxplot today in class and I didn’t cry even once! I’m not experienced enough to be of much help, but it sounds as if Bookgirl might be.